Postal address: H-9400 Sopron, Erzsébet u. 9. This study utilizes a national questionnaire sample and interviews to examine attitudes to climate change as well as perceptions and adaptation activities among Hungarian forestry managers. The results show the respondents addressing climatic changes are concerned mostly by the decrease in the number of snow-covered days, but differences of opinion can be attributed to geographical location and the forest areas managed. 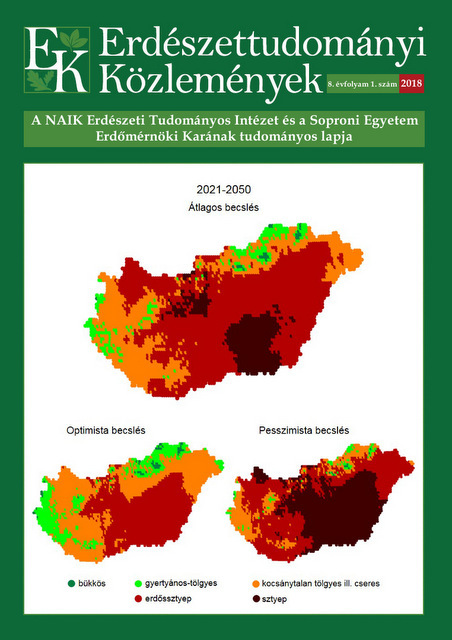 Hungarian forest management is still in the preparation phase with only 16% of respondents reporting the implementation of climate change adaptation measures; however, many foresters claim this is often hindered by legislative constraints. Those who have implemented adaptation measures show an increased concern toward climate change on average; they have been aware of climate change for a longer time and regard it as a serious problem affecting their management activities. The study has evidence that state forest managers do not adapt better than private foresters do, high level of concern and nature conservation factors do not hinder adaptation. However, during the interviews respondents reported that nature conservation factors do, in fact, hinder adaptation processes. 1. Jankó, F. (2014): From regional to global climate change: Three chapters of science history from Hungary. Bulletin of Forestry Science, 4(2): 9-20. Jankó, F. (2014): From regional to global climate change: Three chapters of science history from Hungary. Bulletin of Forestry Science, 4(2): 9-20.